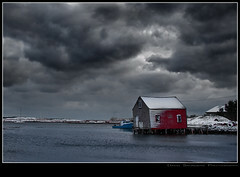 Winter storm rolling in from the Atlantic Ocean. I'm getting a little sick of the cold and ice and I'm sure you're getting tired of my winter shots. Believe it or not we just got another storm last night! It never fails, we always get one in Spring. This is just a straight RAW conversion in Lightroom2 except for the border/resize/watermark etc... in CS4. EDIT: After uploading this shot I found the sky look too blue. I quite sure it wasn't that blue when I was there so I desaturated it and replaced the photo. Hope you don't mind.